“Do what you say and say what you do”… long ago we realized the need for knowledge when working with the soil and plants. Asking the right questions and showing respect for people, workers and consumers are the prime rules. We are committed to the environmental responsibility of sustainable agriculture; we have an open-book policy. But our commitment goes even further: La Burgondie is a daring brand based on an economic model representing fairness for the consumer and for the winegrower. Our Chardonnay and Pinot Noir should be accessible to everyone! The legendary little knight character that appears on our bottles and on all our branding truly captures the essence of La Burgondie. Courageous, confident and loyal. 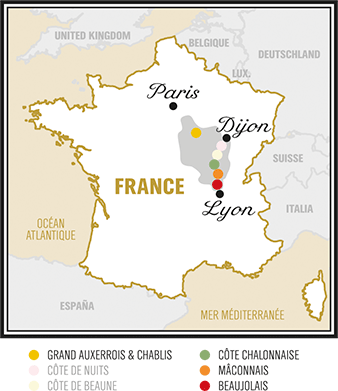 We are a forward-thinking, like-minded group of individuals who are fiercely proud of our Burgundian roots, our beautiful region and our wines. Passion, solidarity and centuries of expertise has brought us together in a collective effort to bring you the best that our beautiful region has to offer. Our wines, produced using environmentally friendly farming methods, are evocative of our hard-working co-operative-winemaker families who give their all, and have done so for generations. It’s our way of life in a glass.